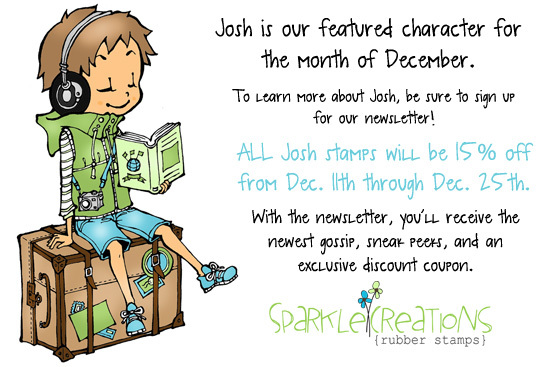 Hello and Welcome to Day 3 (the final day) of previews for the December release for Sparkle Creations Rubber Stamps! Sparkle is releasing 2 new SCRS images and 1 new Karber clear set this Saturday! 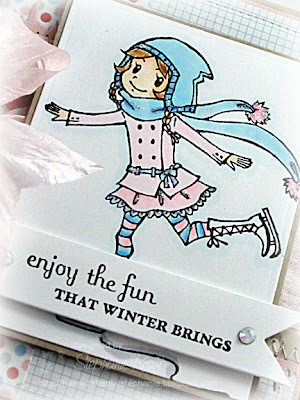 Today we are previewing the final SCRS image, Ice Skating Chloe and sentiment, "enjoy the fun that winter brings"! Be sure to visit all rest of the SCRS designers for more peeks of Ice Skating Chloe. Sparkle will be giving away a Ice Skating Chloe to one lucky person! For a chance to win, you need to comment on all of the designer's blogs (list below). Then head on over to the and comment on the Chloe post. You have until midnight EST each day to comment. The lucky winner will be announced the following day! Accessories: Die-namics Icicle Border, Die-namics First Place Ribbon (My Favorite Things), Corner Chomper (WRMK), Markers (Copic), Silky crushed ribbon (May Arts), Swarovski crystals, Star Dust Stickles (Ranger), Foam tape, Thread, Sewing machine. Beautiful card, Stephanie!! Love the soft colors!! Oh how sweet and fun your card is! Stephanie your card turned out to be very gorgeous with the pastel colors. Love that you included the bow and stitching. Such a sweet card Stephanie! Great job coloring the fine detail and LOVE the PP DP ;) That pink bow is to die for! love the soft colors you used and that big ribbon is soooo yummy! beautiful card, Steph!